In reality it is a geological phenomenon found only here, explained by a certain mix of black minerals belonging to the erosion of granite rock. The beach is very narrow at high tide. The market ‘village’ with shops restaurants and pavilions overlooking the beach and the sea make it a pleasant spot to stop and enjoy the view and do a little beach combing. This is not really a spot for sunbathing and swimming. 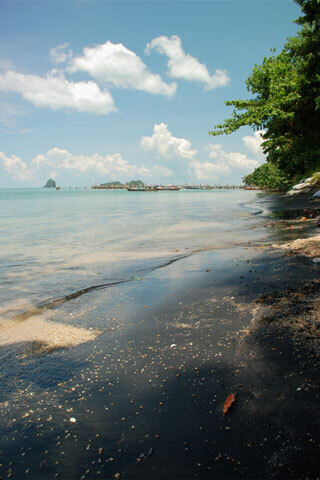 Black Sand beach is on Jalan Teluk Yu west of the Padang Lalang round on the north side of the island.